For more information, click here to contact the Pollinators Committee. 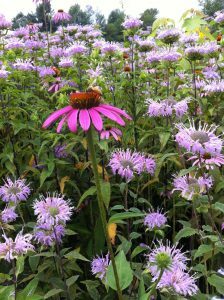 The purpose of this committee is to inform Hamilton County Master Gardeners (HCMGA), as well as the public, on the importance of pollinators and their relationship to vegetable gardening, flower gardening and landscaping. It also serves to provide information on not only pollination of flowers, plants and trees but to include info on the effect of pesticides, beneficial plants, flowers and trees to attract pollinators and especially types of native plants, flowers and trees that will ensure our local pollinators reproduce efficiently and survive. The committee highlights native pollinators as well as honeybees. Doug Rohde noticed that HCMGA was lacking any pollinator knowledge, information or a committee specifically for pollinators. He came to a 2013 board meeting and delivered a short presentation on pollinators, emphasizing the need for a committee devoted to incorporating pollinators into the HCMGA mindset. After the presentation, the board agreed that a pollinator committee be established. Doug was elected as the committee chair and several months later Deb Rood was included as a co-chair. Doug’s emphasis is on native pollinators while Deb specializes on honeybees.